Each year, hundreds of individuals perish while crossing into the United States from Mexico and Central America. Death while crossing the desert is often due to dehydration and other medical emergencies. Often migrants get lost and are poorly equipped for the treacherous journey, succumbing to the desert heat and exhaustion. As a result, in 2004 a coalition of community groups came together in Arizona to provide humanitarian aid and prevent deaths in the desert. 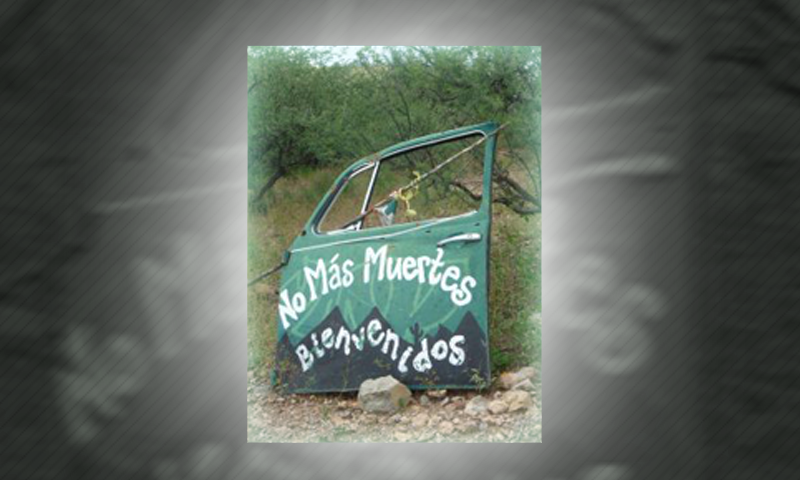 This coalition formed into the group known as No More Deaths/No Mas Muertes and operates officially as a ministry of the Unitarian Universalist Church of Tucson. The No More Deaths volunteers lay food and water out on desert trails and provide emergency first aid services to those in need. Their work has expanded into providing search and rescue services, as well as documenting the abuse of migrants. Since 2008, the organization has conducted their humanitarian aid work with the full awareness of Customs and Border Protection and during the Obama administration had even negotiated an informal agreement that they would not raid their aid encampment in the desert. However, last week all of this came to a crashing end. Border Patrol arrived at the No More Deaths camp demanding volunteers surrender four migrants the officers claimed to have tracked into camp. As per the policy of No More Deaths, volunteers refused to hand the sick over without a warrant. A helicopter and 30 armed officers in 15 trucks returned a day later to serve the warrant and apprehend the four severely dehydrated Mexican migrants. While news reports indicate that one of the individuals was alleged to have a criminal record in Mexico, it’s important to note that the business of saving lives precludes volunteers from running background checks on every person they encounter who is in need of life saving medical treatment and/or food and water. The desert region where No More Deaths operates often sees temperatures in excess of 100 degrees during the summer months. This coupled with extremely rugged terrain makes it all the more dangerous and the emergency aid all the more critical. Anecdotal reports indicate that many migrants crossing the desert today are not in fact newcomers but individuals previously deported who are attempting to return to family members in the U.S. There is also likely an increase of asylum seekers crossing the desert after being turned away by border agents who are illegally refusing to put them through the normal asylum processes. This is increasing what is already a humanitarian crisis in the desert and the fear is that the death toll will rise. Border Patrol’s blatant attack on humanitarian aid is chilling and seems like an attempt to discourage the group’s life-saving work. While the agents may believe they are simply doing their jobs, what they don’t realize is that they are instead closing the door on urgent care for many who will now have to go without and may ultimately die in the desert as a result.